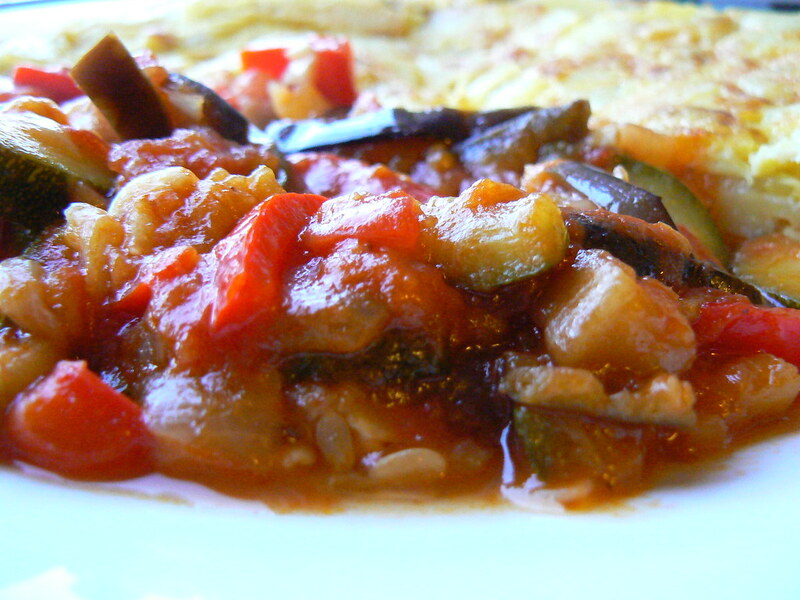 Ratatouille, a fragrant vegetable stew, is a traditional dish from Provence. It is very versatile, as you can serve it warm or cold, along pretty much anything, be it eggs, fish, meat, rice or pasta. It is an uncomplicated and humble dish whose flavors are inversely proportional to the trouble you take making it. Here we bring you the recipe by Clem, Manjada’s French connection. 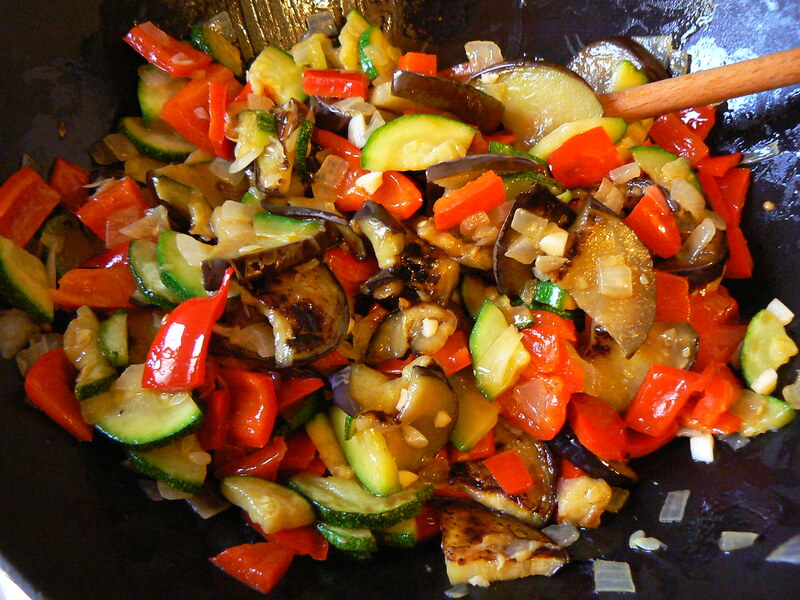 Ratatouille, a fragrant vegetable stew, is a traditional dish from Provence. Even though I grew up in Normandy, literally on the other side of France, this is a very emotionally charged recipe for me. My mum used to make large quantity of it and store it in jars for me to take when I would go back to my small studio flat in my university town. Then, whenever I needed a fix of mum’s home cooking, all I needed to do was open a jar and reheat the ratatouille on my lonely electric plate. I even crossed the Channel with jars of ratatouille when I went to study in the UK. It’s also one of the first dishes I cooked when I started living too far away to carry jars in my suitcase (even though by that time my mum would still send me smelly packages of French cheese, without, interestingly enough, getting any of us into trouble with border authorities). 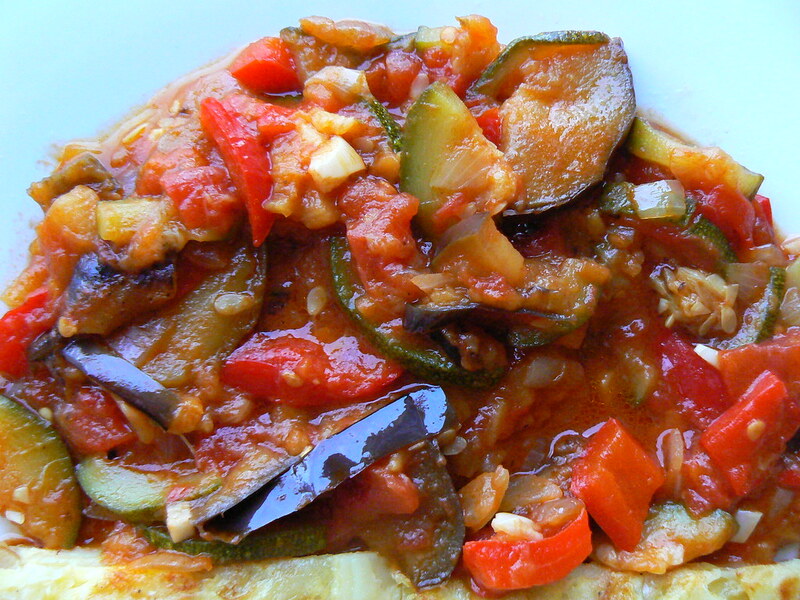 My husband and I joke that, if he seduced me with his famous recipe of eggs fried in his grandmother’s home-made olive oil, I won him over by cooking ratatouille to complement the eggs the next time he fried some. Ratatouille is very versatile, as you can serve it warm or cold, along pretty much anything, be it eggs, fish, meat, rice or pasta. It is an uncomplicated and humble dish whose flavors are inversely proportional to the trouble you take making it, even though you’ll find sticklers who insist that each vegetable be fried by itself, then combined together and baked in the oven. 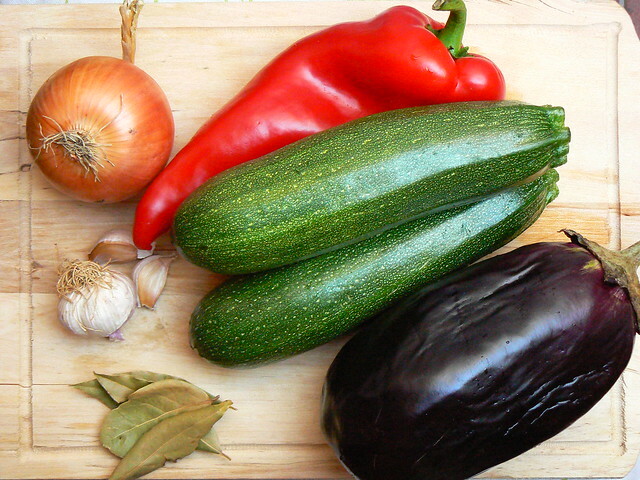 Here, I’ll give you the recipe I got from my mum, a one-pot-person, but I promise to try the vegetable-by-vegetable method next time I make ratatouille and report about it! 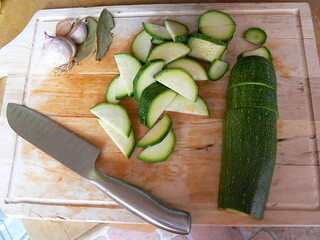 Wash the vegetables and chop them, the onion and garlic rather finely, the rest in larger cubes. Put salt on the diced eggplant and leave it half an hour so that it lets it water out and is easier to cook. Rinse and drain it. Fry the onion in vegetable oil with a bit of salt until it is transparent and soft. 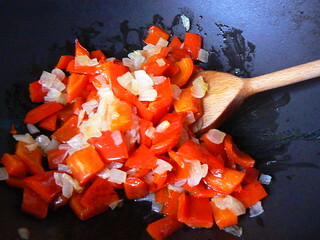 Add the garlic, fry it quickly on high fire until it’s fragrant, then add the diced vegetables. Add more oil if necessary, add salt, stir well and continue frying on high fire for a couple of minutes. Lower the fire, put the lid on and let the vegetables sweat for about 5 minutes. Add the tomatoes, the bay leaves and the thyme twig, put the fire on high to bring to a boil. 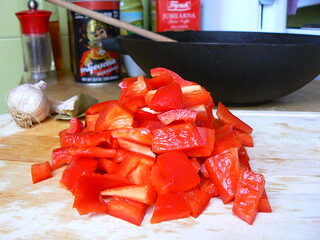 Simmer for about 40 minutes, until the vegetables are all cooked and most of the liquid has evaporated. Remove the bay leaves, check if it needs more salt, and add pepper and the other herbs if used. Add a dash of olive oil before serving it with, why not, omelette made on some good Croatian olive oil. If you wish to store the ratatouille, fill sterilized jars with piping hot ratatouille. Then add a thin layer of oil and screw the lid on tight. Let them cool before storing them.